Visit the Local Government Commission website for a full overview of the proposal , the details, and what happens next. 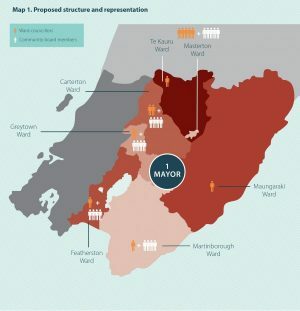 On Tuesday 18th July, the Local Government Commission briefed the three Wairarapa councils on the final proposal of the Wairarapa District Council. Early 2018, at the earliest: If a poll endorses the final proposal (or a poll is not called for), a transition body would be formed. This would include representatives of the three current Wairarapa councils, iwi and an independent chair. Copies of the final proposal are available at www.lgc.govt.nz and are available for viewing at Carterton District Council Office and Carterton Library on Holloway St. Copies are also available on request to the Local Government Commission at info@lgc.govt.nz; or by phoning 04 460 2228.